Qualter Hall were employed by Raymond Brown Construction Ltd to design, supply, install and commission the M&E equipment for operating and controlling the swing bridge, to allow the passage of marine craft through to the nearby cement works. The specification stated that all equipment supplied should be economical and low maintenance, designed in accordance with the latest specifications and codes. 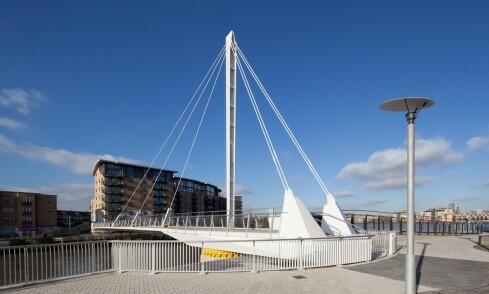 The bridge is now operated and controlled by Greenwich Borough Council. After fabrication, all of the support steelwork for the mechanical equipment was shotblasted and painted using a glass flake system, which is suitable for a marine environment with low maintenance. Before delivery to site all the mechanical equipment was assembled within the Qualter Hall workshops to ensure component compatibility and provide an opportunity for client inspection. The bridge is normally operated from the operators desk which is provided with a vandal resistant lockable cover and is located on the adjacent approach ramp. A radio pendant is also supplied for use during maintenance activities only. The bridge initially starts to rotate in creep speed first before accelerating to full speed for the majority of the cycle, before finally decelerating down to a controlled stop. The speed and angular rotation can be controlled and adjusted to suit site conditions, which was agreed during the final testing and commissioning phase.